How many employees are needed in a factory? The only employee in a car factory must do all the job alone. 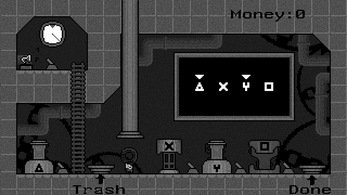 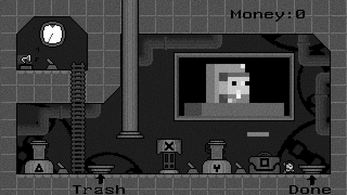 The superior lever make the items fall and the screen shows which machines should be used for each item. The employee leaves the item in the machine and activate the lever in the right corner of the machine. When finished, the employee must throw the item in the pipe which is written "done" and, only if in case, the employee had put the item in a machine that he shouldn't, he must throw the item in the pipe which is written "trash"